This versatile ornamental is great for cool season planting with color! Giant rosettes of frilly leaves - in shades of lavender, deep rose and pink as well as crisp white and creamy yellow - make ornamental kale a favorite additions to any winter garden. 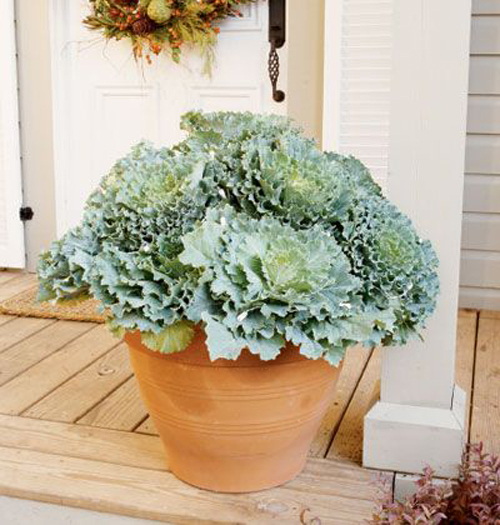 Because these showy cabbage relatives tolerate cold weather and can hold their brilliant color all the way into spring, they are ideal for growing in garden pots to display on porches, patios or beside entryways. If you have never planted a garden container with these member of the cabbage family - you are missing and easy opportunity to add delicate elegance, bold color and stunning greens to your fall garden or patio area. There are a number of different plants to choose from and the range of colors and styles they provide are huge. 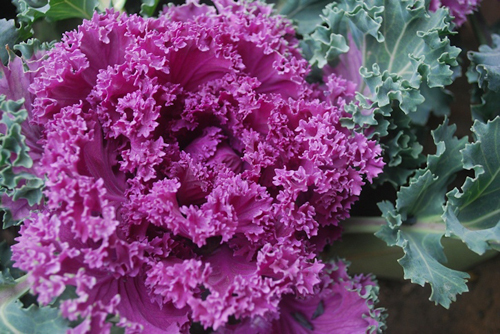 Try dinosaur kale, redbor kale or white flowering kale. 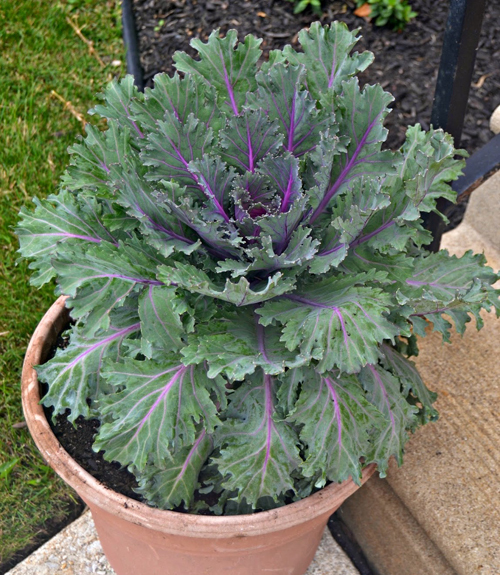 Plant kale as soon as possible so heads develop fully, the color will intensify as the weather cools. 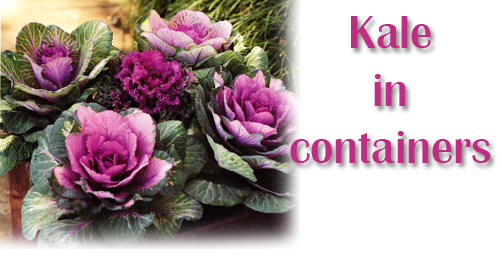 Set several kale plants of the same color in a large pottery container. Combine them with cool season bloomers such as primroses or violas. Varieties whose leaves are blushed with rose or lavender are especially pretty with blue flowered violas. Display the planted pottery in full sun or light shade. Water regularly and feed every other week with a fertilizer like fish emulsion. 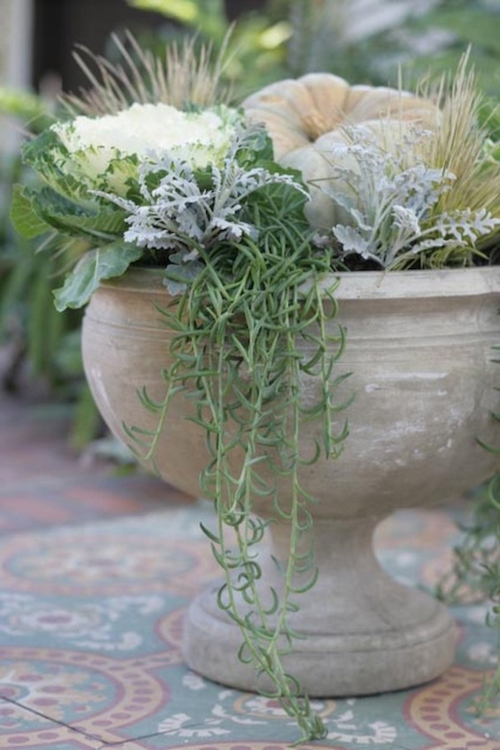 When selecting a planter to use, try something that will help to add color. Many of the poly resin, fiberglass or ceramic pots have vibrant deep colors in many different color categories. This time of year your yard, garden and patio areas will need all the color they can get. Read more.....Pots in impossible places.